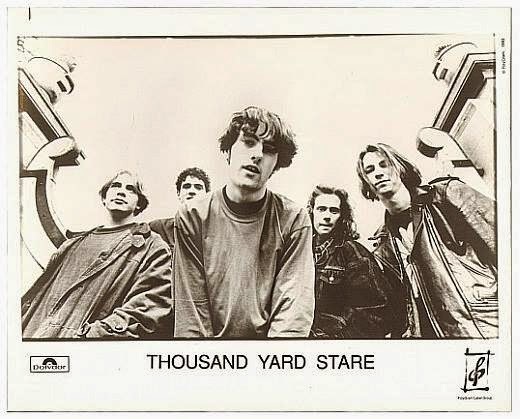 Starting their career with a series of sell-out EPs that grabbed them a major label deal and support slots with James and Carter USM, Thousand Yard Stare were one of the most creative indie bands emerging in the early years of the 1990s. They recorded two albums Hands On and Mappamundi before calling it a day. They've recently announced a London date on June 6 to raise funds for a cancer charity. It's been 22 years since Mappamundi came out and the band called it a day. Why are you doing a show now after so much time away? It came about after some online conversations last year. Dom first suggested it in 2009 as that was twenty years since we recorded our first demo tape but for one reason and another it didn't come to anything at that time. Last year someone all the band knew sadly passed away from cancer and there was a photo of Dom playing guitar with her kids on Facebook. Someone posted a comment about a Thousand Yard Stare reunion and we got talking again about playing a gig to raise some money for a cancer charity. We hooked up in Brighton, as Giles and I both live in the town and couldn't be arsed to go to where the others live!! Seriously it just made sense to come to where two of us were based, we went out for some food and drinks and had a proper catch up on a Saturday night and then into a rehearsal room the next day. It sounded good, which was obviously our first consideration, so we thought let's do it. Have you stayed in touch over the years? Yeah, we have to varying levels. We've got a lot of mutual friends and our paths have crossed at various weddings and parties down the years although last December was the first time all five of us had got together since 1993. What line-up will be playing the London show? It's the line up that recorded the albums back in the day. Stephen singing, Dom on drums, Kev and Giles on guitars and myself on bass. I wouldn't have wanted to do it if any one of the guys hadn't have been involved and I think the others felt the same way. Have you been back in the studio rehearsing already - how is that going if you have? Yeah, like I said we had a few hours back in December and ran through seven songs we'd agreed on previously. They sounded great and it was pretty amazing how tightly we were playing. We've all carried on in other bands and doing bits and pieces over the years plus we gigged a lot as Thousand Yard Stare and it just feels that some of those songs are ingrained in us! We've probably played some of them well over 250 times at gigs let alone all of the rehearsals when we were first together. We hooked up again last weekend for two more rehearsal sessions as we felt seven songs didn't really constitute a set for a gig! We've got around sixteen or so now which seem to work well together. What sort of set-list can we expect from the show, will you cover all bases or will it focus more on the earlier material? We're pulling tracks from both studio albums we recorded, Hands On and Mappamundi, as well as various tracks from earlier EPs. There's probably more from the first album and earlier EPs as we split not long after Mappamundi was released so didn't get the chance to gig those songs so much. Looking back at that period in the early 1990s, what were your highlights? Blimey, there's so many to choose from. Playing the NME stage at Glastonbury in 1992, a mad five days up in the Shetlands always brings back great memories, touring the US, hearing the band on the Top 40 rundown when Comeuppance charted, making the cover of the Melody Maker. I'm sure the other guys would have more to add too. No regrets to be honest. We were talking about this last weekend when we got together to rehearse ahead of the show in June. We made things happen for ourselves, weren't particularly calculated or contrived about things and I think that appealed to a lot of people. It would have been great if it could have carried on but the second album didn't sell as much as Polydor wanted and they dropped us after that. We had a good ride though and can all look back on those times with a great deal of pride. Is this a one-off gig or are there plans for more things once the first show has been done? At the moment it's a one off. We'll see how it all goes and talk about it afterwards. We're a lot more spread out these days, Stephen's in Bristol, Kev's in Scotland and Dom's still up not far from Slough so getting together regularly takes a bit more organising than when we all lived within three miles of each other. Plus we've got kids, mortgages and other responsibilities which we all need to consider. All that boring real life stuff that gets in the way! Your back catalogue is pretty much unavailable now, particularly your first two releases - Easter and Tumbletown - are there any plans in the pipeline to rectify that? Well Easter 89 and Tumbletown were only ever demo cassettes which we sold at gigs. I think Kev was talking about uploading them to Youtube as audio tracks and he also mentioned that Amazon are now selling Hands On as downloads. With regards to that and the other stuff we released after we signed to Polydor we're not really sure who owns those recordings or even where they are to be honest! We're toying with the idea of some new T-shirts for this gig in June though, it was always a massive part of what we were about and it feels like a good way to connect those days to the here and now. Thousand Yard Stare play London Borderline on Saturday 6 June. Tickets are still available from Stargreen. Thousand Yard Stare are on Facebook and Twitter.